& The Life and Work of Michael Harner by Andreas J. Hirsch, Ph.D.
Remembering Michael Harner: A memorial celebration of the life and work of Michael Harner, 1929 – 2018. A recording of the live stream of the event held on April 14, 2018 in northern California is now available to view free online. 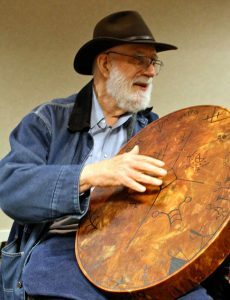 It is with great sadness that we inform you that Michael Harner, Founder of the FSS and originator of Core Shamanism, transitioned early in the morning of February 3. He was supported in the days prior to his passage by his loving wife Sandra Harner and his devoted family. He passed peacefully out of this world and on to the next. Michael’s legacy lives on in this world through all of you — his tens of thousands of students and practitioners of shamanism. His work will continue into the future through the educational efforts of the Foundation for Shamanic Studies. Share a story or post a comment below. In memoriam, “The Way of a Shaman” — from the Foundation for Shamanic Studies Europe. my studies with the foundation. Thank you!!!!!! Love and gratitude. Life and imagination are so much bigger and wonderful because of Michael Harner! My teacher was Kenneth Meadows. Kenneth was taught by Michael (amongst others) and he went on to write books and teach core shamanism. It is clear to see that Michael had a huge influence on Ken’s knowledge, wisdom and way of practice and this was reflected in the Shamanic Practice I was taught. Learning about the shamanic ways really helped me to make sense of my life and the experiences I had been having since early childhood. It bought clarity to my thoughts, values and world view. I was struggling with the disconnectedness of the people in this world, just couldn’t understand or relate. I would say that Shamanic Practice has changed my life and way of being or rather facilitated me coming in to understanding or alignment of those things. Shamanic Practice is life changing. It is with great respect and honor that I acknowledge the huge role that Michael has regarding my own shamanic practice. I am so grateful for his life, his wisdom and his ability to share shamanics with so many. I will continue to hold Michael in my heart and daily prayers in gratitude. Ahhh, Michael… U r on the trip of your everlasting, now! You provided me the opportunity to live and learn through the grass roots community in Berkeley about Essie Parrish and the world of Shamanism, altho Essie never called herself a shaman. I did the divination to find where we would live at the time that my dear Ruby was dx’d w a congenital brain tumor. As i told Michael, we were balls to the wall! It was like finding a needle in a haystack, but by feeling what we wanted, and trusting in what we wanted of our lives, we found our new home, just a few miles down the road from where Essie lived and worked, among her relatives. It was where my daughter attended school, acted in theatre, and ran her own business at the age of ten. She passed here 9 days before her 13th b-day. Thanks Michael, for providing the tools to find where we wanted to be to enrich her last days this time round on this earth. You remain my teacher… Through the veils. “If there was ever a person to be welcomed by the ancestors, and those who live in the upper and lower worlds, he is the one. Such a celebration!!! So much good, so much giving, such a good sense of humor, and of honor. His last book- no secrets, except those not his to disclose. Truly, a gift to all of us who ever knew him. I am forever grateful to Dr. Harner for introducing me to “The Shamanic Journey” at Omega, Rhinebeck, NY July 1987. We are your legacy dear Michael. I’m grateful to have experienced YOU as my teacher. You’re teachings are forever threaded in the shamanic work I do. I smile in your memory… your gentle laugh, and yes– those grinding stones 🙂 Thank you dear one. Walk on! Michael’s work changed my life; the FSS trainings changed my life. His light will endure throughout time and place. I am eternally grateful for his curiosity, his passion, his teachings, and his being. I am eternally grateful that Michael’s teachings were introduced to me in 1981. My experiential entrance to NOR shifted my paradigm in unimaginable ways. I feel so fortunate to have learned with Michael to navigate magical realms that truly have brought forth wondrous and power filled healing not only for myself but my many clients that have benefited enormously over the years. Michael was able to overcome his academic training biases and plunge deeply into the many worlds of NOR to bring back to us these profound and previously hidden teachings that truly bring forth miracles to alleviate pain and suffering in ways that traditional talk therapy can never address. I will always carry deep appreciation and thanks for Michael’s intrepid and committed passion to share with all of us the wonders of hidden realities embedded with love.. Very lovely and heartfelt John! Michael was already moving partway into retirement by the time I took a few classes with him back in the late 1990’s and early 2000’s (a 2-week intensive and then several years later the 3-year series of week-long workshops), so I never experienced him in what I would guess was his “shamanistic” prime. I was none the less definitely impressed by his abilities to invite actual spirits and create nontrivial results in several of the class exercises and demonstrations. But what I was by far most impressed with was his rather subtle and adult invitation to attendees to consider if and when and how one should engage with spirits. On the one hand, through some of those old videos he had us watch and some discussions after, he advocated the consideration of the way some (probably) bad spirits had been taking over and creating healing cults in Brazil by possessing and then tossing away local healers-to-be. And by implication (only), he asked in effect if that has ever happened in any way to us or anyone we had met here where we live. On the second hand, he created learning opportunities to sit back as an onlooker and see and think about conservation of healing effects in our class circles (for those who had already been working for a while). I definitely saw some of that (some people getting better at the expense of some getting worse) in the three year workshops I attended, and I probably wouldn’t have gotten the chance if I was busy running my own show. And on a third-hand, through the use of a few traditional techniques (such as using the elements of a costume to turn connections on and off) and discussions of our results in a greater circle with alternative points of view, he at least gave us the opportunity to reconsider the long term consequences of our actions and our practices and the various natures of the “things” (the spirits) that come over us when we ourselves are working. I wouldn’t pretend the above was Michael’s prime interest — again and again he spoke to his concern that all connection to shamanic practices might be lost. But I personally admire him for doing quite a bit better than just teaching a lot of people some basics and then kicking them out the door. He actually gave those present some opportunity (and a few tools) to think more deeply about what sorts of things were actually going on during a wide range of spiritual phenomena. I personally think that is something that is now long overdue, and I thank him for offering a few tools and a few examples for getting it started again. I studied with Michael in the 1980s while working on a graduate degree in anthropology at the New School for Social Research in New York City. Michael was a wonderful professor! A wonderful man! Michael, though I never met you. I will never forget you. I will always be grateful for your work,for your commitment to the work, and to the students. You and Sandra have been mentors to thousands- that work will go on. You will be missed. I am deeply saddened to hear about the passing of Michael Harner. I met Michael in 2012 after about 2 years of studying his work. He was a significant influence on my own path, and encouraged me to further my studies both within core shamanism and beyond. His physical presence will be missed although his legacy and teachings will live forever. I am holding FSS in my heart and on my mesa during this time. Michael Harner’s consciousness has separated from his physical form, and flys free! Many people have worked with Michael and Sandra Harner and Susan Molkeke to preserve the legacy of FSS for many future generations of students, initiates, support for sacred world treasures of shamanism across the planet, and an archive of shamanic research which will keep researchers ecstatically busy for decades. Often legacies are thought of as what’s left of a lifetime of work. Michael Harner has left a legacy which has no end. It has seeded a magnificent rememembering for many thousands of students past and future. I want to thank Dr. Michael Harner for bringing his work to the forefront and creating what is considered contemporary shamanism. It was an honor being a student of his like so many others and incorporating “core shamanism” into my life and in turn, helping so many others. I will continue to strive on the path of his shamanic legacy, by being in service to this work and the community. He leaves big shoes to fill which can only be done by all of us. My condolences to his family and may he rest in peace surrounded by love. I myself never had the opportunity to meet Michael. I had always hopped I would some day. I have taken many classes in the past, but not with Michael. Read his books and loved the work he has brought into this world. Loved the documentary done on him. The new awareness that he has started, and continues to work on. This is such sad news to us all and sadder news to those who have yet to find this path. For they will always wish that they could have met him as I have. Maybe we will see him in our journeys. Thank you for sharing with us. Prayers and hugs to the family. Michael Harner had a very important and permanent influence on my personal spiritual development. Though the contact was brief the impact was major. By showing me the directness and elemental nature of the shamanic journey, through actual experience, he made me aware of the foundations of human spiritual expression, enabling me to see its presence today. This helped me shape my personal vision and practices. Thank you Michael, and bon voyage! Gracias Mikel por tus enseñanzas. Feliz vida presente y futura. Thank you Michael for your teachings. Happy present and future life. Michael was briefly the head of the graduate anthropology department at The New School (in NYC) when I was doing my graduate degree there. He was a great professor, always with a sense of humor and full of knowledge (famous for smoking his cigars in his office – this was the 1970’s so smoking was permitted). Loved the classes with him. Have regretted not taking in class of religion while there. Yeats later took first wife to a shamanistic weekend seminar. I’m too mental – can’t get there myself. But my then wife was very successful on the first effort to get a spirit guide. But she doubted the reality of what she experienced. I suggested to Mike that the next day, since they would be going to the upper worlds, to have the participants write down what they see and experienced before sharing. If what is seen and experienced on the various levels is similar that would provide evidence the upper worlds are real, not imagination. The next day Mike followed my suggestions. Most everyone got to level one and many to level two. Only 3 or 4 to level four, including my wife. There they all described the same structure and scenes. It was a wonderful way to dispel the doubters. Though not in contact for years, I have always kept a close place in my thoughts and heart for Michael. But happy he is in the upper worlds and continuing his work there. In walking my spiritual path I owe a great deal to so many people who have helped me and been instrumental on my journey, but none as much as to Michael Harner. Although his Core Shamanism may not be for everyone (and I moved on from it myself), it is undoubtedly true that he brought hundreds of thousands of people back to the shamanic path in the West. His work has been a life-line to so many people, to help them find their way to the shamanic path. On a personal level, I can barely begin to convey the depths gratitude that I feel towards him, and how much I owe to him. My life would be impoverished without having discovered his work. For his accessible and practical teachings gave me the tools and confidence to discover and explore for myself the rich and beautiful worlds of shamanism and, most importantly, to find my deeper, more authentic and true soul. That is a gift that is literally priceless to me beyond measure. Michael Harner, although I never met you in person, I send you my heart-felt, soul-felt love, gratitude, respect and blessings for the next part of your journey. It was 1990, and I was 31 years old when I took a weekend workshop with Michael. During those 2 days, I learned to journey to the lower world to meet my animal spirits, and to the upper world to meet my teachers. His core shamanic techniques connected me to dimensions of consciousness where I found my true self and the wisdom to become a co-creator of my life. Some 28 years later, I continue to work with the intelligence and heart connection available through these subtle dimensions of consciousness. I will be forever grateful to Michael and Sandra for their work in preserving and disseminating such powerful tools for psycho-spiritual healing. We would have a different world if similar workshops were as basic to our socialization as a k-12 education. If you’ve heard about shamanism it is because of Michael Harner. Michael not only wrote about shamanism but taught those so inclined to practice it. That is to help others with their pain and suffering in the most ancient way of humankind. Like Michael I am an anthropologist and a student of shamanism but Michael was the master who outlined the core of shamanism world wide and made it’s practice understandable and applicable to western consciousness. I was fortunate to be his student. Michael changed my life. Better put, made it. Showed me how to be a better person and integrate many differing elements that could be used in a compassionate manner. More than that he taught me how to teach shamanic workshops. I owe my entire career to him. He was a guiding light. It’s hard to write as my tears well up. I loved Michael and miss him terribly. I’m deeply grateful for the time I studied with Michael Harner. and the 3 year advanced program ending in April 1996. Michael and a comfort to me. I feel so indebted to Michael, not just for my life in shamanism, but for my actual life itself: Without the Foundation, and all the kind, Foundation-trained people who worked with their helping spirits to heal me, 8 years ago, from late-stage, metastatic cancer that I had been told was terminal, I wouldn’t be here. Good journey, Michael. Good journey. May my love and gratitude help lift you to your new home. Back in the late 80’s to early 90’s. Is when I first attended Michael Harners’s Shamanic Basic Core Class in New York City. It was held in Manhattan, NY, inside a basket ball gymnasium on 7th Ave. It was quite a large group that attended for that weekend. Michael was teaching. It was great to meet and learn from him. The weekend was a memorable one that I will never forget. The experience, and the Shamanic method Michael taught is great. And the other thing that I will never forget about Micheal is his sense of humor. There were many laughs in between the lessons. May Michael’s wife family receive much love and support during this period of mourning and may Michael finally return back home to the universal stars among ancestral spirits. May Michael Rest In Peace. My life and world have forever been changed by Michaels workshops. I took the workshops in curiosity and as a cynic, being stretched uncomfortably and came out as a believer in NOR and its benefits and wondrous ways. I did not have the privledge of meeting him but have grown through his workshops and books and have experienced the impossible !!! in journeys and meeting spirit animals and helpers. Many blessings Michael on your new journey !! Thank you again. Although I never met Dr. Michael Harner I have attended several of his workshops taught by members of the Foundation. I have enormous respect and admiration for Dr. Harner’s work and his willingness to preserve and recuperate this ancient human cultural treasure. Thank you Michael, with gratitude. I only met Michael in person one time, at a weekend workshop in Seattle in 2004. But I feel like I knew him much more than that from his books and from the CD’s of his dialogues with his distinguished guests at the annual meeting of the FSS. His kind-heartedness, his wisdom, his wit, and his wonderful irreverent sense of humor really shine on those CD’s. And of course he made shamanism accessible to Western societies that are in dire need of its teachings. A great teacher produces great students, and at his workshop I met one of his assistants who lived in the Seattle area and went on to take classes from her that were very inspirational and helped me on my path. I also gave him a CD of Native American songs by a man I knew named Beaver Chief, and I was pleasantly surprised a couple weeks later that he took the time to send me a personal thank you note. I am sad that he is no longer with us in physical form, but I also feel that it is a time to celebrate his life and the richness of all that he gave us. He inspired a lot of people and touched a lot of lives in a really good way. Sobbing, just a mess now, trying to absorb the news of his death, trying to understand my own emotional reaction, this opens a new door of thought, that he was 18 yrs older than I, and if I can make it until 88 I will be lucky. I cry because in my entire life, up to now, the number of highlights, highest vibrational moments, I can recall are rare and precious. Michael was there when I first met my power animal and when I did my first soul retrieval and first divination. He guided me through days of joy and laughter so deep and rich I will remember them forever as highlights of my life. From the first class, he taught at the Chelsea High School gymnasium in Manhattan, 1993-4, to the two weeks intensive at Esalen, where I arrived in a black suit having just flown from my mother’s funeral in Florida…and rounded out by the magnificent fifth West Coast, Three-year program he taught me, and took me through the miracle journey of the rope-bound Shaman. He gave me a bright new strength as I was moving through my 50’s into middle age. Few beings have ever moved me forward like he did. He led me into new shamanic realms of spirit and healing, giving me the highest of self-esteem. Walking the path of the drum was in itself an entirely new kind of human experience for me; it helped me flourish in my regular life as an artist. Why cry now when I have not seen him nor Sandra Harner in years, sadly. Why feel the loss now, when I have been gone and away from the foundation a while. I was waiting and dreading this day. I worried about Sandra Harner. I worried about myself. How can we not have MH alive anymore? Missing the man, his face, his humor and his hat. Sandra, I hold you in a tight embrace of sadness, and of love, for you, the mighty warrior always by his side. He inspired in his deep focus and academic purity. As an anthropologist, he lived the life he studied. His contribution to the world’s knowledge base is priceless, and his scholarly approach to his mystical subject matter gave his foundation legitimacy. I mourn for him. I keep sobbing as I write about him. I loved him so much, and will always sing his praises. Few people in life have affected me as strongly and positively as he did. Being on the board of trustees of the FSS for years, he invited me into his and Sandra’s magic mountain home, into their kitchen to share delicacies from Mill Valley, all memories of another family, another “home” from my East coast base. Like another set of parents or older siblings, Sandra and Michael became dear family to me for several decades. I cannot stop weeping even though I know he is with us still, its just the memories of our times together that make me cry with bittersweet tears. I am so proud of his foresight, to bring Susan Mokelke into the leadership of the FSS to take over from him. A great visionary bringing in another great visionary to protect his life’s work and keep it moving forward. I’m a newbie, but my shamanic journeys have taken me to new and powerful truths, not otherwise available. Thank you Michael for recognizing, honouring, and documenting this planet’s home religion. It’s always been here, not: imported, imposed, or contracted. It was discovered and rediscovered by an endless line of human hearts, and your great work has helped to open many doors into non-ordinary reality for those who seek answers in other worlds. Rest in loving peace brother. I think of you Michael Harner as a courageous explorer of unknown frontier, a pioneer mapping the mysterious inner world, a compassionate being who generously gives back to indigenous tribes, a teacher inspiring countless students with your creation of Core Shamanism. I never met you in person but hoped you would address our upcoming 3 year class. Michael, may you be received with great joy and celebration in the realm of Spirits as you continue your great work. I heard for the first time about Michael Harner when I awoke (my love) to the shamanism, in Brazil. All Brazilians shamanic practitioners respect and honor Michael. It’s a dream for everybody there coming to California to study at the FSS. I’ve been living in California… so the dream is so close of coming true. We honor, respect and love MH. We are very grateful for what Michael did. Much Light, Michael Harner! I will be forever grateful for the tireless and passionate work Michael Harner and the FSS has done on behalf of Shamanic cultures world wide in regards to preservation and education. Because of the Core Shamanic teachings, I was able to pass through spaces within non-ordinary realities and reconnect to sources or compassion, healing, love, support, and personal empowerment I could only dream of. Micheal, your light and legacy will continue through your students, and their students, and so on, and so on. Love is service and service is love. Thank you. Thank you, Michael. I did not know what I was doing at that first workshop thirty years ago. You put down a little, ratty brown blanket on the hard floor and had one simple candle. One hundred people were gathered in a double circle. The scent of Basil came around. When you first beat the drum, I knew I was home. I knew I was home. Later, you said to us that you do not have to follow your Guides. Try it and see what happens. As a Shamanic Practitioner, I quote you sometimes. The trick is to understand the Guides clearly. That is the Practice. As Michael Harner transitions I feel a deep sadness and joy as I reflect the passing of this extraordinary man who shared the most profound collective knowledge of the wonders of the non ordinary reality of Shamanism. It is through this that I came to know my beautiful friend, amazing teacher and mentor, my dear sister Gizelle Rhyon-Berry. The gifts I have received are numerous, including beautiful poems and songs that have come to me from the Stars through the compassionate Spirits that I have come to know and love. This song came to me when a dear lady lost her young brother. It is healing when feeling loss of a beautiful soul in transition back to the Stars. Thank you dear Michael Harner for awakening my being to “all that is”. I am forever grateful for the stairways that carry me to the dream worlds creating this magical play called life. May your journey be gentle and swift. Your Star will shine brightly above forever! It is true that Mr. Harner has changed many lives and this is also true for me. Nothing in my religious, social or professional background was even remotely close to shamanism. I got my initiation thanks to the book. Since then, thanks to my spiritual helpers, my life has changed so manifold that I have even a hard time listing all the changes. May I also add, without arrogance and exaggeration, that the new insights gained through Mr. Harners introduction into the world of the spirits and the wisdom of my spiritual helpers I was given the strength to participate in the change of millions people’s lives, this in association with my Indian friend. He was a true philanthropist. May he rest in peace. Michael was a great teacher and was subtle in sharing his wisdom and knowledge of a world that most of us had not even considered before learning of Shamanism. He will be missed in our physical world but be with us always in the upper world. Thank you Michael. It was with great sadness that I heard the news of Michael Harner’s passing. Anthropologist, Founder of the Foundation for Shamanic Studies (FSS), Teacher, Mentor, Friend. I had the privilege of being one of his field associates for Nepal…and the honor of delivering his annual Living Treasures stipend to the three Tibetan Lhapas on his behalf. May his journeys beyond be filled with wonder. I met Michael in an shamanic Workshop in the early 80 in Alpbach Germany. Michaels knowledge and wisdom that has been a part of my life upto now. Through him I have integrated shamanism in my life and have been able to help animal people and human people over all these years. I will allways Keep him in my heart. Thanks to Michael Harner’s work and the Foundation for Shamanic Studies, I was introduced to the practice of Shamanism many years ago. My studies through Foundation workshops and personal practice have put me on the most profound spiritual path I have ever experienced. I am so thankful to Michael Harner for preserving these ancient teachings and bringing them to our modern society where they are so needed during this time of transition, both as tools for survival and as a path to authentic connection to all of creation. Hi Carol. You are a living testimony to the truth of what this work is about. Good to read your message. I’ll never forget YOU! I am gleeful at the thought that Michael now gets to walk in one world with both feet…that he is exploring the other side of the veil, the great mystery, what he has professionally flirted with his whole career. I believe that Michael is one of the most influential people in all of our lives, introducing us to and leading us into this very sacred path. It is a beautiful lineage that lives on. It is our sacred duty to carry on the teachings and wisdom that he introduced us to, that pinhole, that portal he lead us through, which has opened up into the most amazing, healing, wisdom-giving of NOR landscapes…through which he changed the consciousness of the world, and so shall we continue. Thank you, bless you, Michael, on your holy ride. With abiding love and gratitude for all that Michael did in his life and work for so many beings here and in all worlds! May the seeds of his teaching continue to flourish in our lives, and in the work of our hands, carrying forward forever the beautiful medicine of core shamanism and the helping spirits. More than 30 years ago I had the great good fortune and privilege to attend an extended shamanic workshop with Michael in the Sierra mountains. The experience opened up a pathway for me to journey to other worlds and realities and the wonders of shamanic practice. I relished reading the other posted comments. It seems that all who met Michael Harner experienced a soul who was imprinted on us. I only spent two days with him in a workshop in 1999. Yet I will never forget his presence, smile, laugh, voice, teaching, dance, and heart full outpouring of knowledge, wisdom, and passion. Not many in our world have the impact he has had, and will continue to have. He has lit many little fires that will continue to burn more brightly as time goes on. Since hearing of his passage, I have rejoined the FSS and resumed journeying, after a ten year break. So many memories from the workshop and his CDs have flooded over me. But there’s one line that I keep hearing him say – “There’s no place for a guru in shamanism. I like flowers and chocolate just as much as the next guy. But there’s no place for a guru in shamanism.” If there were, it would be you. Thank you, Michael.